Reinstalling Windows XP with 10 easy steps! Have your Windows XP to crash, slow, virus infected or corrupted? 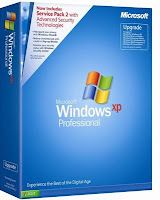 Well the best way to overcome such things is to reinstall your Windows XP, because this is a powerful and effective way to overcome it, you are guaranteed a computer such as new again (like a new born baby). But before reinstalling Windows XP is, it's good you backup important data on your computer. Turn on the computer and place the Windows XP CD into your CD drive. Restart the computer. After viewing a text message that appears at startup, before Windows loads. Press any key to boot from the CD drive. If you do not see this message, and the computer does not automatically load Windows from a CD, do the restart back, open the BIOS settings, and the boot sequence and then change the settings on your computer with a CD dirive order to position 1. Save the new BIOS settings, and let the computer run its tasks. Then Windows setup will be run from CD. Initially, the screen will display a blue line with the text at the bottom. When the welcome to setup screen appears, press ENTER to select the Windows XP set-up. After receiving the license agreement, setup will offer several options, either to repair the installation of Windows XP, or reinstall. If you choose to repair Windows XP installation that already exist, press R. If you want to reinstall Windows XP you, simply by pressing the ESC key. Then you will be given the option to place the installation on the drive that is on your computer. Usually on drive C: \. Perform a full format on the drive C: \, but not quickly! feared that the virus is in the Windows XP you are not 100% lost. Setup will spend approximately one and a half hours to install Windows XP. When the program asks for product key and your network settings, enter the appropriate information. Installing Windows may automatically detect and install one or more of your device drivers. Start from the motherboard, VGA, hard drive, and so forth. After re-install Windows XP you are successful, the first thing is to install anti-virus. It is possible to anticipate the incoming virus. And if you do not have any anti-virus program, you can download it for free from the Windows antispyware with at www.microsoft.com / downloads, or free such as AVG anti-virus with a http://free.grisoft.com , Avira at www.free-av.com, and others. After that followed the install program to support other, ranging from Microsoft Office, Adobe Reader, Winamp, WinRAR, Firefox, Nero, and others. How? easy to re-install Windows XP this. And do not forget to always update your Windows XP, so no problem there, and make sure that the product you original Windows XP. Because if you use the product is not authentic, then do not blame me, if the time stamp on your Windows pirated.